The Latino Health Council, a nonprofit organization co-chaired by the Department of Family Medicine’s (DFM) Patricia Tellez-Giron, MD, recently celebrated its 20th year of promoting health and wellness in Dane County’s Latino community. 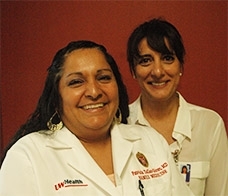 Dr. Tellez-Giron and co-chair Shiva Bidar, director of community partnerships for UW Hospital and Clinics, talked about the Council’s history and current work in a two-part article in the Capital City Hues ( Part 1 | Part 2 ). They reflected on how the Council evolved to serve the health needs of Dane County’s rapidly growing Latino community—one that needed not just professional interpreter services at hospitals, but meaningful, culturally competent health care. Today, the Council facilitates deeper-level collaboration between Latino health care professionals and health system staff. It also educates the Latino community on health system access, disease management and wellness through a monthly radio program and a comprehensive community health fair.